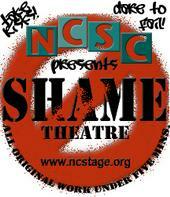 No Shame Theatre is an open performance venue for original and compelling works of theatre. Pieces arrive up to an hour before show time. They're cast, rehearsed, and put on stage in front of a live audience an hour later. We take the first 15 pieces that come in the door at 10pm. If you're a writer, come to the theatre by 10pm with typed scripts. If you're an actor, come to the theatre by 10pm and tell people you're there to act, and you'll act. It's that simple. Dance and you'll dance- you get the picture- the stage is yours! Writers, directors, actors, dancers, musicians -- anything goes: Comedy sketches, dramatic monologues, songs, dance pieces, rants, dadaist constructions, magicians, juggling, puppets and things that we're not even sure exist yet. The only rules are 1) pieces must be short (under five minutes), 2) original and 3) can't damage the space or audience physically. No Shame is a chance to experience 15 works of art that you've never seen before and may never see again. Plus it's cheap, it's fun and it's like nothing else in Asheville. Since starting in a pickup truck in Iowa back in 1986 (it's true), No Shame has launched the careers of actors including John Leguizamo (who used No Shame to develop his breakout piece Mambo Mouth), Camryn Manheim, and Toby Huss, and writers such as Rebecca Gillman, Naomi Wallace, and Jeff Goode. It has spread to more than 30 cities in the U.S., been the cover story of major magazines, and won awards. 10PM to do it. 11PM to watch other people do it." $5 cover to participate or watch.